Apparently my website is out again, so we are back in here. Yesterday I had a wonderful time with Lili, exploding the bank. We went to the Maison en Tissus in the morning, and in Belgium in the afternoon. Of course, we mixed bags, and so I have one of Lili's, and she has one of mine. Not a real issue as we had planned to meet on Tuesday next week. I plunged and got the beta version of Blogger... and got a fright when I thought they stripped this blog of design (on the day I spent an hour doing it), and content. But apparently they just created a new blog to correspond to my gmail adress. Useless. I solved the mystery of the comments. On beta blogs, if you comment and you are asked for your google or blogger username and pass, you can only give your google ID. I also noticed that my Links list was out of date, so for clarity of design, I report you to my Bloglines list, which is even more complete than my usual one. After a search for my passport 2 weeks ago, my "on the go" pouch, it was my bright orange project folder to play hide and seek with me. But I won. Oh, and my brand new halogen lamp broke too, I had to change the bulb. Now I hope it will last longer ! Otherwise I will just buy a regular floor lamp ! 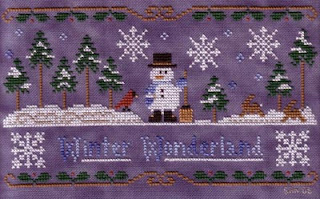 I started Winter eve from Country Cottage Needleworks, on dark blue linen Lili sent me a few weeks ago. She has stitched this design on natural linen as intended, and she feels it's a bit mute. Plus everybody stitched this design on natural linen, so I wanted to change. Ok. Since yesterday during the day, I have no access to my regular website, and I suppose you too. And it's a real annoyance, as I was going to make a great tutorial to make round ornie, and generally work on my website. And now I can't do any of this. And Blogger doesn't want to change my profile, not a happy puppy ! Ok, accepted to change my whole design, it's not so bad. Most of my Christmas trip preparations are done, I even havea new halogen lamp thanks to Argos... But I had to be in town at 9am, (after going to bed at 1am) to be there before everybody else. So here is a picture of Winter Wonderland I finished last night. I hate working on evenweave, linen rocks ! Why? it seems I see the holes better, with evenweave I'm always afraid I would miscount. But hey, extra care makes this piece totally mistake free !!!! A miracle? I see the question "what next?" coming... I started preparing "Country stitcher. city stitcher", and I had to change a few threads (am I too cheap to by more DMC colours, or is it the impression that I already have too many?). My trip project will be the Margaret Sherry cat freebie.